The team has been associated with the Blackfriary project since its beginning. The principal investigators, Finola O’Carroll and Dr. Rachel Scott have been researching and instructing on the site since 2010 and 2012 respectively. The co-directors of the field school, Ian Kinch and Laura Corrway both developed their archaeology careers at the Blackfriary, starting out as students. In 2013 both began teaching at the site. The current bioarchaeology supervisors, Melissa Clark and Nikki Long, are former students who have returned to bring their expertise to the team. This combined perspective of academics, researchers and teachers, and former students makes the teaching team unique. All of us are committed to the ethos of the project, to teach students to the highest standards but in a supportive, friendly way while maintaining best practice and ensuring that the learning experience is well-rounded and relevant to the students’ needs. Finola O’Carroll MA, MIAI, MRPA, holds the Ministerial Consent (Consent Number C420, Registration Number E4127) to excavate the Blackfriary site, issued by the National Monuments section of the Department of Culture, Heritage and the Gaeltacht. She was a co-founder of the Irish Archaeology Field School who were involved in the site from 2010 until 2017. Her research interests include metalworking and crafts in the Irish Bronze Age, Medieval landscapes and Monastic sites. She has over 30 years’ experience in archaeology and started her career excavating at the Viking site of Wood Quay in Dublin while still a student. She worked with Professor George Eogan, excavating the passage tomb cemetery at Knowth in the World Heritage Site at Brú na Bóinne and assisted his research into the Irish Bronze Age. She joined Professor Gabriel Cooney in the Irish Stone Axe Project (ISAP), and from there worked with Dr. Eoin Grogan in the Discovery Programme’s North Munster Project. In 1997 she set up the CRM consultancy CRDS Ltd. with Dr. Stephen Mandal. Numerous significant archaeological projects were carried out by CRDS and Finola had responsibility as Project Manager/Senior Archaeologist for many of them. 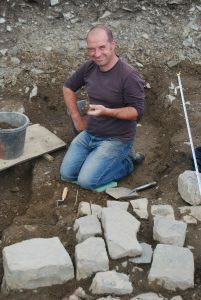 In 2009 Stephen and Finola set up the Irish Archaeology Field School and since 2010 her principal focus has been on the excavations at Blackfriary. From 2007 to 2009 Finola was a member of the board of the Institute of Archaeologists of Ireland, and was Chair from 2009 until 2012. She is a member of the Meath Heritage Forum on behalf of the Institute of Archaeologists of Ireland. Dr. Scott/Rachel is a bioarchaeologist and Assistant Professor at the Department of Anthropology, DePaul University. She has a Ph.D. in anthropology from the University of Pennsylvania, a Higher Diploma in Celtic Archaeology from the University College Dublin, Ireland, and a B.A. in Anthropology from the University of Chicago. Her research interests include human osteology and paleopathology, European archaeology, and anthropological and archaeological theory. Her work addresses the interrelation of biology and culture in the creation of human lives, focusing on the case study of early Christian and late medieval Ireland. More specifically, she integrates human skeletal, archaeological, and historical data in order to examine the processes of identity formation and the social construction of disease. Dr, Scott is currently involved in two field projects, as the director of a project on leper hospitals in late medieval Ireland and as the bioarchaeologist for the Blackfriary Archaeology Field School’s excavation at the Black Friary in Trim, Co. Meath. Ian came to archaeology as a second career and did his BA in NUIM and Masters in UCD with a focus on the building stone at the Blackfriary. He came to the Blackfriary as a student in 2011 and has never left, becoming part of the teaching staff in 2013. He has continued to work as a professional archaeologist with a number of consultancy firms, and recently co-founded Trim Archaeology Projects Ltd. with Finola O’Carroll and Laura Corrway. Laura came to Blackfriary as a student in 2010 and has been excavating here every year since then, becoming a member of the teaching staff in 2013. She did her BA and MA in UCD, looking at the deLacy castle in Carlingford, Co. Louth. She has worked on a number of research excavations and on many commercial ones with consultancy firms. Together with Ian and Finola she has recently co-founded Trim Archaeology Projects Ltd.
Melissa began her career in bioarchaeology at the Blackfriary in 2010 and has returned every year since, first as a student supervisor and now as both a bioarchaeology supervisor and graduate teaching associate for Ohio State. She is a PhD candidate at The Ohio State University, where she graduated with a bachelor’s degree in anthropology, a bachelor’s degree in international studies, and a minor in forensic science. She earned her master’s degree at the University of Bradford in osteology and paleopathology. She has also worked as a supervisor in a Bronze Age excavation in Vrbanja, Croatia, with the Županja/Southampton Archaeology Project. Outside of archaeology, sheis a member of the Forensic Anthropology Case Team in Columbus, Ohio. Her dissertation investigates changes in health between late medieval and post-medieval Ireland. Her other research interests include dental anthropology, stable isotope analysis, bioarchaeology, and education pedagogy. Nikki Long came to the Blackfriary as a student I 2012 while studying archaeology and biological anthropology at Boston University. She has a masters degree in Criminal Justice. She worked at the Peabody Museum of Archaeology and Ethnology at Harvard in the osteology collection, and now works at the Fort Collins Museum of Discovery in Fort Collins, Colorado. She works in CRM projects in Colorado as well.